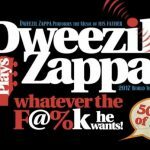 Jamie gets schooled on Zappa…by Zappa! I’ll admit I’ve been slacking on the blog. I get writers block. Blog Block! I now have something pretty exciting to share with you all though. I was lucky enough to do another interview. This time with the amazing and lovely Dweezil Zappa. He is on the second leg of the 50 Years of Frank tour honoring the musical genius and work of his father the late great Frank Zappa. (see it for yourself April 28th 2017 at Harrahs Lake Tahoe) This tour came through Reno last summer at Cargo concert hall and it was fantastic!! Make the trip to the lake this time if you can. You will not be disappointed. You know the radio hits but this is your chance to dig a little deeper. Dweezil called the X and I’ve turned it into a pod cast for your listening pleasure anytime on the main page of the website. Please enjoy and get informed as I did about the Zappa legacy.